This CEO communication will provide a short update on our Canadian pharmacy sales efforts for the HeartCheck™ ECG PEN. As disclosed in prior press releases, the HeartCheck™ ECG PEN has been listed by Shoppers Drug Mart for sale across Canada. As part of the initial phase of the listing exercise, Shoppers Drug Mart has placed HeartCheck™ ECG PEN devices within half of their Canadian retail pharmacy locations (602 stores). These store locations are listed on our website (www.theheartcheck.com) under "where to buy". A review of the HeartCheck ™ ECG PEN pharmacy store listing will also show that we have product in Rexall Pharmacy locations in Ontario and Alberta as well as a growing number of Ontario-based independent retail pharmacies. After delivery to Rexall and Shoppers Drug Mart pharmacies, the HeartCheck™ ECG PEN devices were placed on shelves according to pre-approved store planograms by store-front managers. Pharmacists would not have been directly notified that this new over-the-counter ("OTC") product was now available in their stores. 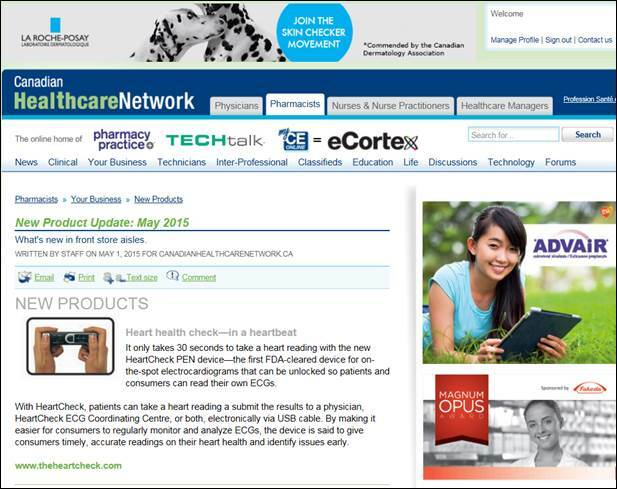 To assist in addressing this, on May 22, 2015, Shoppers Drug Mart implemented a Canada-wide follow-up communication for introduction of the HeartCheck™ ECG PEN directly to all their pharmacists. In addition to specifically addressing the listing presence of the HeartCheck™ ECG PEN, the communication invited any of the stores without a Wellness Appliances Planogram, or stores that do not currently carry the HeartCheck™ ECG PEN, to inform Shoppers Drug Mart that they may make a request to carry the product. The HeartCheck™ ECG PEN is a first-of-its-kind medical device approved for OTC sales without a Physician prescription. Consumers can take an ECG recording by holding the devise in their hands, with a feature to send the ECG to a Vendor Doctor for review and response within one hour. It is a Health Canada Class II Medical Device and allows people to monitor themselves for arrhythmias and for prolonged QTC. The HeartCheck™ PEN ECG is provided by CardioComm Solutions (Toronto) and will provide store support. They can be contacted at info@theheartcheck.com, orders@theheartcheck.com or 877-977-9425 ext. 4. This product is merchandised in the Wellness Appliances Planogram. Stores without a Wellness Appliances Planogram who wish to carry this product as Optional should merchandise it Behind the Counter due to the Retail Price as well as the interaction and counselling opportunity with a Pharmacist. With all Canadian Shoppers Drug Mart pharmacists now introduced to the HeartCheck™ ECG PEN sales opportunity, CardioComm Solutions will now move ahead with a set of pharmacist-based marketing efforts. Our first step will be engaging the Rogers HealthCare Group through whom we will initiate a digital pharmacy campaign. The cross-Canada campaign will involve placement of a rotating banner advertisement on the Pharmacy tab of the Canadian Healthcare Network website (http://www.canadianhealthcarenetwork.ca/pharmacists/). We currently have a leader position under their New Product Update: May 2015. The website is log-in controlled and so a screen shot is provided for your reference. We will place the banner advert on our website soon after the campaign is launched. Our goal is to continue to grow the number of pharmacies carrying our HeartCheck™ ECG PEN in Canada . Shoppers Drug Mart is supporting us in such efforts by confirming we will be placed in their July National Shoppers Drug Mart flyer that will be produced for Canada-wide circulation through all their locations. In addition, we are looking at opportunities for additional independent pharmacy distribution networks outside of Ontario. In April , Shoppers Drug Mart placed one additional order to service the replenishment of inventory at those retail pharmacy locations where the HeartCheck™ ECG PEN has been selling. As a final note, please refer to our Facebook and Twitter accounts where we post HeartCheck™ ECG PEN testimonials and provide updates related to relevant arrhythmia-based news. We thank you for your time and support and ask that if you have any questions to please let us know at investorrelations@cardiocommsolutions.com. This document may contain certain forward-looking statements and forward looking information with respect to the financial condition, results of operations and business of CardioComm Solutions and certain of the plans and objectives of CardioComm Solutions with respect to these items. Such statements and information reflect management's current beliefs and are based on information currently available to management. By their nature, forward-looking statements and forward-looking information involve risk and uncertainty because they relate to events and depend on circumstances that will occur in the future and there are many factors that could cause actual results and developments to differ materially from those expressed or implied by these forward-looking statements and forward-looking information. In evaluating these statements, readers should: specifically consider risks discussed under the heading "Risk Factors" in the Company's 2013 Annual Information Form, available at www.sedar.com; not to place undue reliance on forward-looking statements and forward-looking information; be aware the Company does not assume any obligation to update the forward-looking statements and forward-looking information contained in this Annual Information Form other than as required by applicable laws (including without limitation Section 5.8(2) of National Instrument 51-102 (Continuous Disclosure Obligations). I am providing this update regarding the CardioComm Solutions' Private Placement Opportunity..
Today The Medical Post published a short article reviewing the use of pulse check technologies versus ECGs for the detection of Atrial Fibrillation (AF) in two separate studies.. I am providing this update regarding CardioComm Solutions' Private Placement. I have This is a special CEO update to provide news related to our HeartCheck™ sales and marketing efforts. e.
I have summarized our activities and highlighted the opportunities that are working to realize. November was a quiet month with respect to press releases from CardioComm Solutions (CCS); however, we've been very busy behind the scenes developing new channels for the promotion of our devices and software. The past few weeks have been very busy for CardioComm Solutions. PEN Device & Smart Monitoring Product Evaluation Starts this Week. "It?s been a busy two months for CardioComm Solutions, Inc."
"CardioComm receives excellent initial response from Hospimedica International Advertising Campaign"